Just as the craft beer community around Chicago expands by the day, so, too, does the annual Chicago Craft Beer Week, which runs 11 days this year. It starts Thursday, May 15, and concludes Sunday, May 25. With more events, more participating venues, more suburbs joining (and Rockford!) and a hell of a lot more beer, if you don't have enough to do, you're just not trying. I've narrowed down the many, many events into a handful of picks. 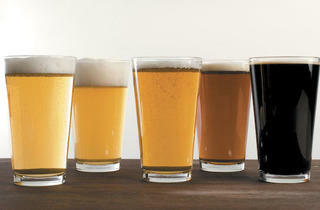 Some are big, some are small, some have an educational aspect and others are just there to pour you great beer. Some have been taking place for years, others are brand-spankin' new. All look awesome to me, and I drink beer professionally. It's nice of the Illinois Craft Beer Guild to host the best beer event of the year on the first day of CCBW, so if you make it to just this one you can feel like you've really accomplished something. Kick your week off with pours from more than 50 breweries, nearly all from Illinois, many pouring new and interesting beers and some pouring for the first time. The event is held at the Garfield Park Conservatory, and even if you don't drink a drop, it's a great place to visit. Garfield Park Conservatory (300 N Central Park Ave), 6:30pm. Yes, the name of the week is Chicago Craft Beer Week, but that doesn't mean we can just ignore the creations of the folks just over the border. Besides, at this point, Munster and Gary have essentially been annexed as part of Illinois as far as beer fans are concerned, and you can't talk about the region's best craft beer without talking about Three Floyds and 18th Street. Upland joins the conversation as well now that it's distributing here and sending cans to Wrigley Field. All three breweries will have beers on tap at the event. Maple Tree Inn (13301 S Western Ave), 5–11:45pm. Pipeworks vs. Emporium: Tap Takeover Edition: With Pipeworks' focus on bombers, it can be hard to find them on draft. Twenty-five handles in one place is an insane amount of access to the equally insane offerings from Pipeworks. (Plus, videogames!) Doors open at noon, arrive early, take a nap later. Emporium Arcade Bar (1366 N Milwaukee Ave), noon–3am. Pig Minds 2-Year Anniversary Party: It doesn't get a lot of talk in Chicago, but I just love the idea of this vegan brewpub on the outskirts of Rockford. Barrel-aged baltic porter, other rare pours, reggae and a brewery birthday party—it's a long drive for us downtown denizens, but I'm sure glad it exists. Pig Minds Brewing Company (4080 Steele Dr, Machesney Park), noon–2am. Atlas Brewing's Prehistoric Beer Prom: I could tell you about all the fun beers and stuff it'll have available, but I'll sum it up with these three words: giant inflatable dinosaurs. Atlas Brewing (2747 N Lincoln Ave), 9pm–1am. Just the word FOBAB (okay, acronym) is enough to set beer geeks' salivary glands working overtime. This year we don't have to wait till autumn to get our hands on a bunch of barrel-aged beers—Haymarket brings more than 20 offerings to pour in two sessions, just like the regular FOBAB. Haymarket (737 W Randolph St), 1–8pm. Monday is a low-key evening, so spend it hanging out and actually learning something about how your beer labels look, why branding is so important, and why art and beer have such a huge crossover. Some great beer and branding minds will be on hand, including Phineas Jones, maker of all those cool-looking Half Acre logos; Michael Kiser of the also cool-looking site Good Beer Hunting; and Lagunitas beer guru Tony Magee. Jerry's Wicker Park (1938 W Division St), 7pm. Full disclosure: This is the annual event organized by my site, Guys Drinking Beer. Two of the three of us are from downstate, and we've always felt that there's just as much going on around Springfield, Carbondale, the Quad and St. Louis as there is in Wisconsin, Michigan and other Midwestern brewing meccas. This is the third year we've put this together, and, well, we're pretty proud of the taplist. This is the only place you'll find many of these beers, so join us for brews from Urban Chestnut, Little Egypt, 4 Hands, DESTIHL, Triptych and Rolling Meadows. The Green Lady (3328 N Lincoln Ave), 7pm. Should you be repelled at the idea of hanging out with us and a number of downstate beer fans, two other excellent options are available. Riverview Tavern (1958 W Roscoe St) hosts an evening of sour beers at 6pm featuring brews by DESTIHL and Transient, or watch the magic happen when Hop Cast sits down at Hopleaf (5148 N Clark St) with Penrose Brewing at 7pm. Folks around Ravenswood, Lincoln Square and North Center know they're spoiled when it comes to breweries (and distilleries) in their neck of the woods. 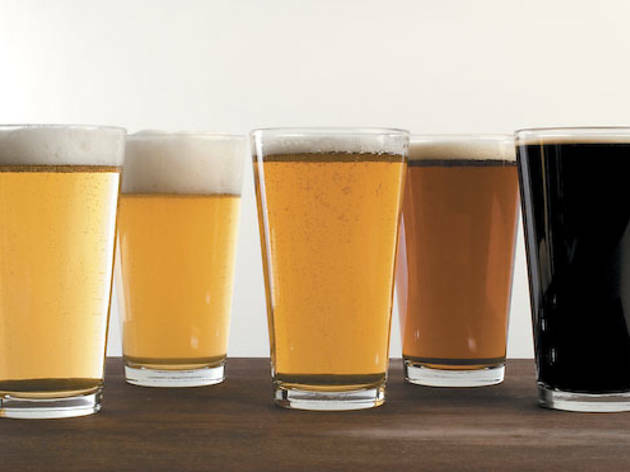 The Cicerone Certification Program, no slouch when it comes to identifying quality beer, is also located along the Ravenswood corridor and is taking an evening to celebrate its neighbors, including Begyle, Spiteful and Metropolitan. Folks at this event will be the first to try newcomer Aquanaut, and while they won't be pouring yet, the new Empirical Brewery team expects to be on hand as well. The Long Room (1612 W Irving Park Rd), 6–9pm. Full disclosure, part two: Guys Drinking Beer serves as media sponsor for this event, but I'd be there even if we weren't. This is the first CCBW for Penrose, since it just started pouring in late March, so it's high time you head to Geneva to check out its new digs. Tickets include a flight of four beers and a guided tasting, private reception, and a Q&A session with Team Penrose and the Mash Tun Journal folks. You may already be drinking its P2 and Proto Gradus, but the really fun stuff happens at the taproom, as recent releases have already seen an oak-aged version of Proto, as well as a grapefruity Radler. Penrose Brewing (509 Stevens St, Geneva), 7–10pm. 5 Rabbit does a number of things well, but it really does summer beers exceptionally well. Its tart wheat lemongrass/coriander 5 Lizard was my go-to last summer and will be again this year, and that's only because I couldn't get my hands on enough of its Watermelon paletas beer. The doors of 5 Rabbit's Bedford Park brewery open this evening to let folks try its new offerings for the year, including a mango/chile creation and a collaboration with Norway's Nogne O. Latin beer by way of Scandinavia? That prospect is plenty interesting just by itself. 5 Rabbit (6398 W 74th St, Bedford Park), 4–8pm. Even though there are a few more events on Sunday, this Illinois Craft Brewers Guild event serves as the closing ceremony for CCBW, and it's a doozy. More than 60 breweries will be pouring, including new folks like Breakroom and Hailstorm, VIP pours from Goose Island and Lagunitas, a bunch of food trucks and (as the ICBG tells us) about a million port-o-potties. Chicago French Market (131 N Clinton St), noon–5pm. If you haven't watched Chris Quinn talk about drinking beer on one of his video podcasts from his Avondale Beer Temple, you probably don't know how entertaining it can be to watch someone who knows a shitload about good beer tell you exactly why he likes the beer that he does. You can get to see that in person at the Green Lady on Sunday when he joins Transient Ales' Chris Betts to talk about the joys of sour, funky, tart, wild ales. R.S.V.P. for it now. The Green Lady (3328 N Lincoln Ave), 5pm.